© Colorado Rockies/VISIT DENVER Coors Field, one of the top five hitters' parks, at sunset. it holds more than 50.300 fans. 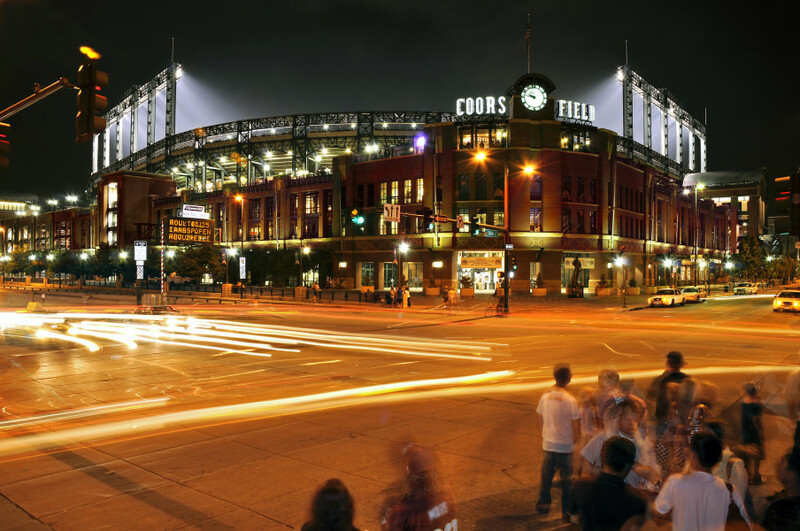 Located in Denver's Lower Downtown neighborhood, just two blocks from Union Station, the Coors Field baseball park is the Colorado Rockies' home field, which is named for the (Molson) Coors Brewing Company, one of the world's largest brewing companies. Coors Field being one of the premier ballparks in Major League Baseball holds more than 50.300 fans, although it was originally planned to seat 43.800. 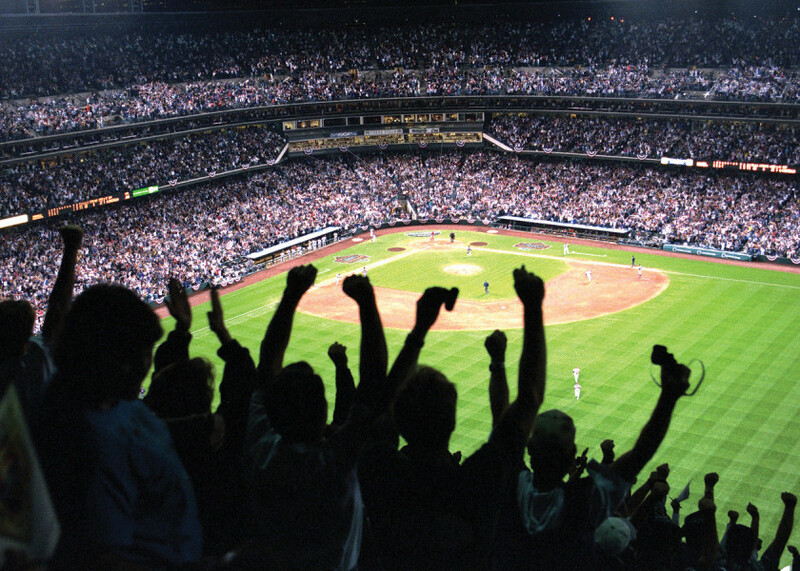 Built only in 1995, the park is already the third oldest stadium in the National League. Moreover, Coors became the first ballpark with a heated infield when it was built. Tours providing a behind-the-scenes look are available Monday through Saturday during the season and Monday, Wednesday, Friday and Saturday during the offseason. They typically last 70-80 minutes, whereas private tours with young children last 45-60 minutes. All of Coors Field's tours are also accessible for disabled guests. 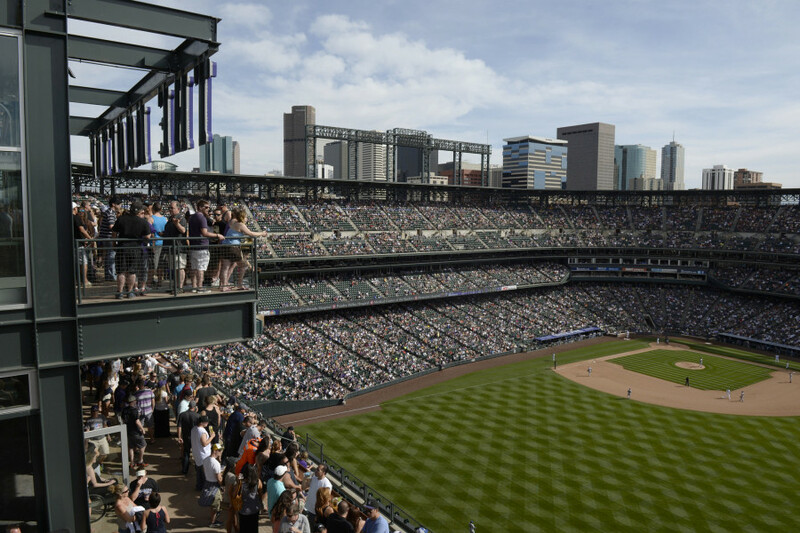 In order to mark the elevation of exactly one mile above sea level, the seats in the upper deck's 20th row are purple, while all other seats in Coors Field are dark green. This mark does refer to Coors Field as one of the top five hitters' parks. Due to its elevation – Coors Field is located about a mile above sea level – the thinner air in and around Denver makes it easier for balls to travel farther, which is the reason why home runs at Coors Field occur 32% more often than league average. The Rockies' official dinosaur mascot came into being due to the fact that quite a number of dinosaur fossils were found on stadium grounds while it was being built in the 90s. These included a triceratops skull, which historians estimated to be 66-million years old. Hence, Dinger is an anthropomorphic purple triceratops. © VISIT DENVER Coors Field at night in Denver's Lower Downtown neighborhood, two blocks from Union Station. 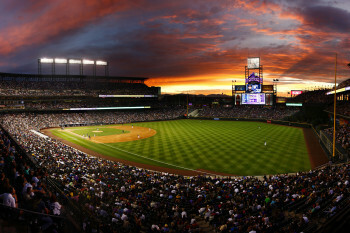 Coors Field is located at 20th and Blake Streets, in Denver's Ballpark Neighborhood. From the North, travel I-25 south to Exit 213. From the South, travel north on I-25 to Exit 212C. From the West, travel east on I-70 to I-25 South and exit at 213. From the East, go west on I-70 to I-25 South and also take the Exit 213. Advanced single-game parking passes are available in a Rockies operated lot for $15 per pass in Lot B. In addition, advanced passes can also be purchased. There is also motorcycle parking available. Since Coors Field is just two blocks from Union Station, you get there easily by public transport. For information on routes and fares visit rtd-denver.com. Bicycle parking is available near Gate E, at Gate A, across from Gate B. There is also bike parking along Blake Street.